We have HughesNet Gen5 at a remote cabin and back in December I unplugged our modem and brought it home. Today I logged in to check my bill and noticed there was over 4GB of usage showing this month. I've read plenty of other posts about phantom usage and haven't seen any like my scenario where the modem has been unplugged for months. I emailed tech support (case 110103145) explaining the modem has been unplugged since December and we have usage showing. I received back the most ridiculous cookie cutter reply saying it could be my netflix usage, automatic updates or VOIP. They didn't even read my issue or make any attempt at resolution. Alrighty...My morning coffee has kicked in and I actually think I know what the problem is...why it is that your graph is showing data being used. Back in December, you powered off the modem, packed it up in a box and took it home with you, however, when your refresh date came around, HughesNet was unable to communicate with your modem to refresh the data charts (being that it was unplugged) so they continued to display the OLD data usage that you had used prior to unplugging the modem. As soon as the modem is powered back on, your graphs will refresh and display the correct data usage being used from the time you plugged back in your modem. Basically...whenever you sign into your account, the usage chart (which I circled in red) will continue to show the same exact thing....4464.00MB. 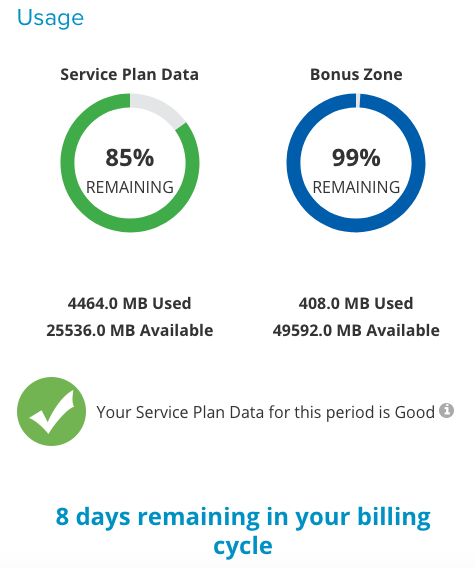 This is the amount of data you had used back in DECEMBER prior to unplugging the modem. Whenever you decide to plug back in the modem, this chart will refresh. Of course, @Amanda can double check this come tomorrow..
Based on what you are claiming in that your modem has been unplugged since Dec. it certainly does seem impossible that you should be incurring any data usage. The two Hughesnet employees that moderate the community are only here Monday through friday (8am - 5pm) so unfortunatley you will have to wait until Monday before you can get some help with this matter. The good news is that these two employees @Amanda and @Liz are corporate level representatives and they have the ability to run remote diagnostics to find out what is going on with your modem and what could be possibly causing this issue. These two gals are extremely good at resolving customer's technical issues, so if you can be patient over the weekend I have no doubts they can troubleshoot this with you come Monday morning. @bare65Thanks for the info and tagging the two you mentioned. I'd really like to get to the bottom of the usage being indicated on my account. Not only is my modem unplugged, I brought it home with me on my last trip to the cabin in December. It's not like somebody broke in and started downloading! yeah..it's certainly puzzling considering that not only is it unplugged..but it's not even in the cabin where the actual dish is located, lol. I know it's a pain in the you know what having to wait until Monday but if anyone can help you, these two gals are the best of the best. If I remember come Monday, I'll bump your request up to the top of the page so that it doesn't get overlooked or missed. @bare65No problem waiting until Monday, no rush. Hopefully there's a simple explanation for what is showing. Thanks for your assistance. Logged in to check on usage again this morning, the data showing up as used remains the same and the billing period has reduced by 1 day. This is only for reference. To clarify this scenario, the Gen5 dish is at our remote cabin 3 hours away. In December I disconnected the modem and brought back to our main home where it has remained in a box. I logged in to check my bill yesterday and the usage stats showing on my account at my.hughesnet.com is where the above screenshots are from. So overall, this isn't a situation where I have devices hooked up that I didn't know about and they're using up the data, the modem is literally unhooked and located 3 hours away from the dish and hasn't been turned on since December. let's chalk my reply up to not enough coffee consumption. I've since removed it LOL!